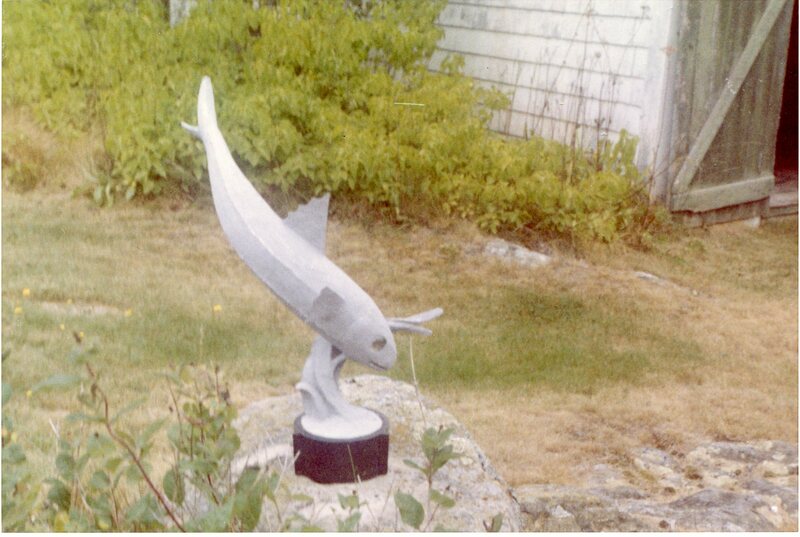 Fish Leaping, side view, at North Haven cottage in Maine, made of sculpmetal, an experimental material. Frederick Warren Allen, Sculptor c. 1960. A beautiful sea creature, here created from the rich imagination of an artist. Its forked tailfin rises high above its head as it dives into the waves. Still swimming elegantly in the air with the narrow flexible body swishing from side to side, its spiny dorsal fin is raised like a sail with a scalloped edge, stabilizing it as it enters the water. The pectoral fins also provide stability, a flat trapezoidal shape of equal size and placement on both sides with the same scallop design repeated from the dorsal fin. The weight of the long graceful body is supported just under the gills on the equally graceful curves of the waves. The fork in the high caudal fin is mimicked by a fork formed between two low waves on the same side at the base of the composition. The whole piece is positioned in a metal collar, off center, yet perfectly balanced. It could spin beautifully if it were free to move on the round base. Sculpmetal was an experimental clay material that could be used for sculpting. It was described as a sort of malleable metal that you could work with your hands, then polish to a metallic sheen when it dries. For Allen, it was an experiment in a new medium and the new modern style of the times, a brilliant look for the shining scales of this silver fish leaping above the waves. 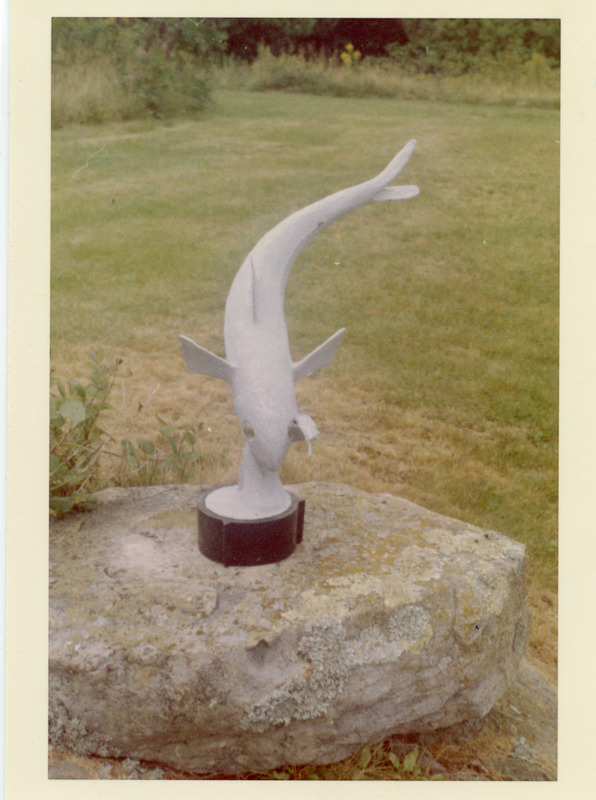 Fish Leaping, front view, a modern design in sculpmetal, shows balance achieved off center on small base. F.W.Allen, Sculptor c. 1960. Anatomically, one feature contributes to the design. There are two parallel ridges the whole length of the body, which add visual length to the actual length of the fish. The “lateral line” is an essential sensory organ that runs along the sides of a fish from the head to the base of the tail to detect movement in the water around it. Here Allen shows it almost as a superficial vein. It is actually a fluid-filled canal just under the skin, similar to a vein. Parallel to it and lower on the side is another ridge. There is no anatomical equivalent, but the line indicates the typical division of dark back scales from white belly scales, acting as camouflage against predators. No images or information other than a note by Elizabeth MacLean Smith, Allen’s assistant teacher.